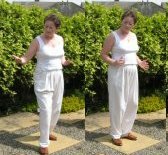 Enjoy another of our free qigong exercises with these step by step instructions for 'holding the sun in one hand'. We use it as part of our warm up routines and it is very relaxing to do. It looks as though you are holding a ball in the palm of your outstretched hand and as you move your arm the ball follows the path of a circle - if you would like to be a bit more poetic you can imaging the sun circling the earth. when the sun is in your left hand move it anticlockwise round the dial and when the sun is in the right hand move it clockwise around the dial. you can also do this exercise with a weighted tai chi ball as a form of resistance training - avoid anything too heavy because you are stretching forward and using lower back muscles.